It was a bitterly cold but wonderfully bright morning for the Christmas handicap. Thanks very much to the many members who turned out to make it such a fun event. Results are here. Congratulations to Mark Darcy who was absolutely spot on and to Andy Smith who wins the coveted trophy for the worst estimate. Thanks very much to Mick and to everyone who helped. Here are some pictures and a copy of the Echo report. Hardley results are below. You can see the full results on the Christchurch Runners site. Hardley results are below. You can see the full results on the CC6 website. Paul Ashley writes, " First time I have done this race and would really recommend it to anyone as its a friendly,cheap and cheerful event and ideal way to gain a bit of leg speed before next years RR10's. 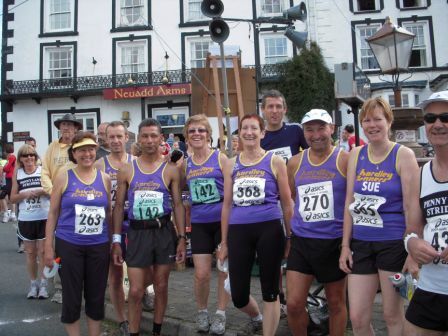 Next event is on 18th December so ideal for warming up for the Hardley Handicap run on the Sunday. You can find out more about the series on the Poole Runners website Hardley results are below. If anyone has a link to the full results please let me know as I can't find them anywhere. A good Hardley turnout - well done! The new course was excellent and the start arrangements greatly improved. What's more, despite the forecast gales, the sun shone on us apart from a shower about half way round which had a pleasant cooling effect rather than dampening enthusiasm. Hardley results are below. You can see the full results here. Malc Renyard was 4th in the prestigious event. For report please see News tab. Thanks very much to everyone who helped organise and marshal the race. 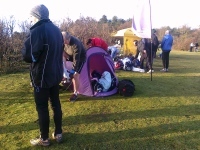 It was the best turnout ever for a CC6 with 182 runners - well over the previous best of 165. Hardley results are below. Our men's team were 3rd and our ladies 5th and we remain 1st in the combined. You can see the full results on the CC6 website. It was a lovely Autumn day if a little chilly, an excellent course and conditions were good apart from some stones under the leaves in the woods. Roy van Hal, our Cross Country Captain, writes, "Saturday 7th November saw the second race of the Hants cross country league take place at Goodwood. Due to injuries and other commitments we had only 6 people race in the mens, which was a bit disappointing after the big turnout at Farley Mount. But, the boys that did turn up once again did the club proud. Ian Banks, Andy Kellaway, Mick Anglim, Paul Carter and Jeremy Barber all finished and we had a creditable finish of 7th in Senior Division 2 and 5th in Vets Division 1. Jack Hutchinson, despite not feeling well, turned up and had a go but was not well enough to finish. I am still collecting entries for the Southern Area championships at Parliament Hill on 30th January. Entries need to be in soon so anybody who has not already let me know, be quick." Well done all. Thanks very much to everyone who sponsored Annie who raised a tidy sum for Alzheimer’s. A pretty good turn out with 13 Hardley ladies and 25 men. Hardley results are below. You can see the full results on the CC6 website.After this first race Hardley are 1st ladies' team, 3rd men's team and 1st combine team. Well done! Thanks very much to all our members who helped our half. As this is a HRRL event we also fielded a team. Thanks to all concerned and especially to those who doubled up as marshals as well and in Sue's case as sweeper, hence her honorable last place. Hardley results are below. For the full results please see the Solent Half tab above. What a lovely day for a run and by all accounts a well organised event. Hardley results are below. Congratulations to our Marathon runners who won the men's team prize!! Congratulations also to Nick Newton who won the men's Over 50 award and also a special sweat shirt in recognition of his 11 out of 12 Clarendon races!! You can see the full results here. This 12K on sand dunes and beach was, to quote Aleks, "****** hard". Here are a few pix of our intrepid band of ladies and gentlemen on the nudist beach. Hardley results are below. You can see the full results here. Hey that was fun! Thanks very much to everyone who made it possible by organising, helping on the day and competing. Hardley results are below. For full results and pix please see the Test Way Relay tab. Claire, our Ladies' Road Race Captain says, "Well done to all Hardley Runners who ran in the Overton 5 on Saturday with both the men's and ladies' teams getting off to a solid start in the HRRL season - both teams in a respectable 6th place in their respective leagues. A very pleasant evening with good conditions that made for a fast run. What a difference from the wet and slippery going last year. The good weather also brought a good turnout from Hardley and the other clubs. Hardley results are below. The full results and league tables should be available on the RR10 site (see links tab) on Thursday evening. Our thanks go to all the organisers of the various races and to the people who co-ordinate what is the best series of runs I know. Well done all! Congratulations to Hardley's Stu McGowan who won the M60 Gold in Prague in the European Long Distance Triathlon Championships adding to his 2009 European Duathlon title. For more information see http://www.britishtriathlon.org/news/article.php?id=10322 . Here are the Hardley results but they don't count towards overall scores for the series becuase this race has been selected as the one where results for Hardley members don't count to compensate for the navigational error which led to no results counting for our race. There is more information on the RR10 site (see Links tab). We welcomed five new members on this lovely midsummer evening. Thanks very much to our Stubbington Green friends for an excellent run. The course was well marked with the tree roots picked out in yellow. And it is the first time I have ever been offered seconds of the post race drink by someone coming round the tired runners with a jug. Well done! Hardley results are below and here's an album of pictures. This race lived up to its name of The Hardest Half so it was good to see all six Hardley members in the top 10%. Sadly that was the top 10% in terms of age rather than finishing place and it was new half marathon personal worsts for us all. But John and Martin did very well and Mike and Guy were 2nd and 4rd in the over 60s which is pretty good. The views were excellent and so were the tee shirt, sun hat, medal and post-race picnic but the hills were hard, especially the one with 275 steps that we had to go up and down twice. Where were all the youngsters? Hardley results are below. Click on a runner's name to see the photos. You can see the full results on the Tionium site . A good Hardley turnout and an excellent result with Hardley taking first and second for the men and first woman. Many thanks to our good neighbours, New Forest Runners, for inviting Hardley to a very friendly and enjoyable Duathlon which was particularly popular this year. You can see the full results on the NFR website. Our apologies to all the runners who went off the route. We got it wrong with the marshalling which sent you in the wrong direction. As a result we had to abandon the event. We are very sorry. "First of all a big thank you to everyone who turned up to help with our event. Everything looked good on a warm evening but unfortunately it went downhill from there with a marshalling error sending the runners in the wrong direction. I would like to apologise to all marshals who had to deal with some understandably disgruntled runners and thank everyone for pulling together to make sure everyone got back safely. I think that apart from the embarrasment this has caused,we will have to treat this as a learning experience and already ideas are coming forward as to how to ensure we do not repeat this experience and also how to ensure our runners get back safely should a similar error happen in another race." A small band of Hardley Runners took part in this fast course 10k on a wet and wintry June day. The entry was closed a few weeks earlier, with 1000 runners enjoying the course, which comprised 2 scenic laps of Poole park, skirting the town and coming back along the sea wall, with views of Poole Harbour over to Brownsea Island . Here are the Hardley results. Congratulations to Dan for breaking 30 minutes on a difficult course. You can see the full results here. Another good turnout from Hardley and a very big field overall. This race set a new record for the number of women finishers, with 152 against the previous record of 135, and without the Running Sisters as well! Not quite a record for men, 238 against a previous record of 240 at race 2 in 2006. Total finishers, at 390, is also a new record. The course was fast but the dry weather made the going more than a little dusty for those at the rear of the field. It was a bit like following a herd of charging wildebeast across the Serengetti. You can see the full results on the RR10 site (see Links page). You couldn't have asked for a better evening for the third RR10 and there was another good Hardley turnout. The going was good and the course was fast if a little rutted in places. It was a new course whuch gave those not blessed to be at the front wonderful views of everyone ahead of them from time to time. Hardley results are here plus an album of pictures. You can see the full results on the RR10 site (see Links page). Excellent conditions (though a bit chilly before the start) and the new course was good if slightly crowded in the first few hundred yards. The uphill finish was cruel though! A wonderful Hardley turnout with 37 men and 18 women. Here are the Hardley results. The full results are on the RR10 site (see Links page). It was a bright sunny day for the London Marathon which made it quite hard going. Hardley results are below. Click on a runner's name to see the splits. Click here for a few pictures. You can see the full results on the London Marathon website, here. A lovely evening, good going underfoot and an excellent turnout including 18 women and 31 men from Hardley. Here are the Hardley results. The full results areon the RR10 site (see links page). A great run and the views from Tennyson Down are stunning. Only 8 miles long but still with 900ft of ascent so fairly testing but definitely one to repeat in the future, especially when the weather is as good as it was this time. You can see the full results here.NB there are tabs at the bottom of the page to get to the various results. Excellent conditions. Hardley results are below. You can see the full results here. Perfect conditions, with very little wind, though too much direct sun for some perhaps. A very good Hardley turnout. Hardley results are below. For the full results click here. Our men's team were 7th. Hardley results are below. For the full results click here. A lovely day. Like Exbury the week before, a very scenic run, this time with the first part touring the zoo. The course was more than a little undualating as the times show. Congratulations to Andy for being 2nd overall. Hardley results are below. For full results please see the Exbury 10K tab. Thanks very much to Martin and all the organisers and to the many marshals who made the race such a success. Congratulations to Andy who was second overall and to our men's team, Andy, Dan and Dale who took the trophy. Jane Morgan and Jack Hutchison competed in the British Orienteering Championships held in the New Forest. Jane came first in her age category (W45L) and Jack came 4th (M60L). Another terrific result which is diifficult to know about is that John Horton (M50) choose to run in the Over 21 Long category as Grizzly/Bob Graham (52 at 52!!) training and came 8th against lads half his age!! Well done! You can see the full results here. Another good Hardley turnout and congratulations to Claire for another win and to the Hardley ladies who won the league. Also to Dale who was the only one of us to run in all the races. This was the last race of the season so we have the overall results. Claire Dyer won the ladies title, Hardley ladies won the women's league, Hardley men came 3rd in the men's, We came 2nd in the combined league, Dave Jewell won the v60 with Mike Smith 2nd, Dale Purdom won the v40 with Ian Banks 2nd. You can see the full season's Hardley results on this spreadsheet The complete results for all teams are on the CC6 site (see Links tab). It was great to see Terry Burton and hear him shouting us on. The course was on grass all the way. Undulating but not excessively so and pretty good underfoot. Men's results are below. Ladies will be published when they are available or you can check on the HCCL site (see Links tab). Here's an album of photos. Hardley came away with two first prizes and were second man's team. Well done! Full results here. A good Hardley turnout on a very cold morning. Click here for pic. Sounds like an interesting run. Martin reports that, " I ran the last 500m with my eyes closed for most of the way due to the sand being blown off the beach and across the promenade - managed to miss the finish line and only stopped running when somebody shouted!" Hardley results are below. You can see the full results here. 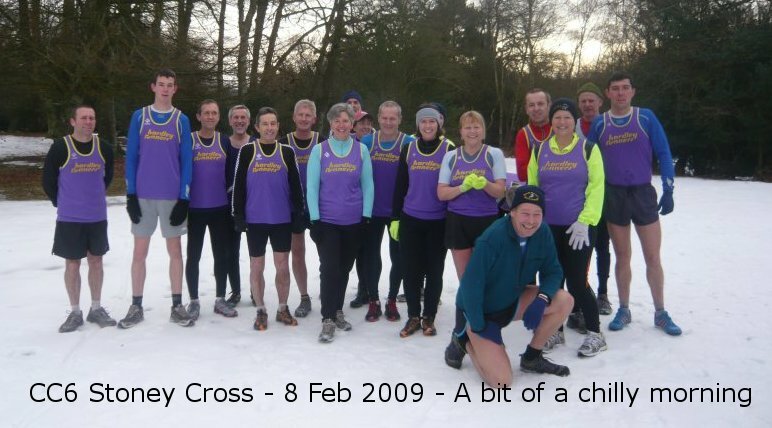 The next HRRL event is the Bramley 20 which is a very good training run for those doing a Spring marathon. 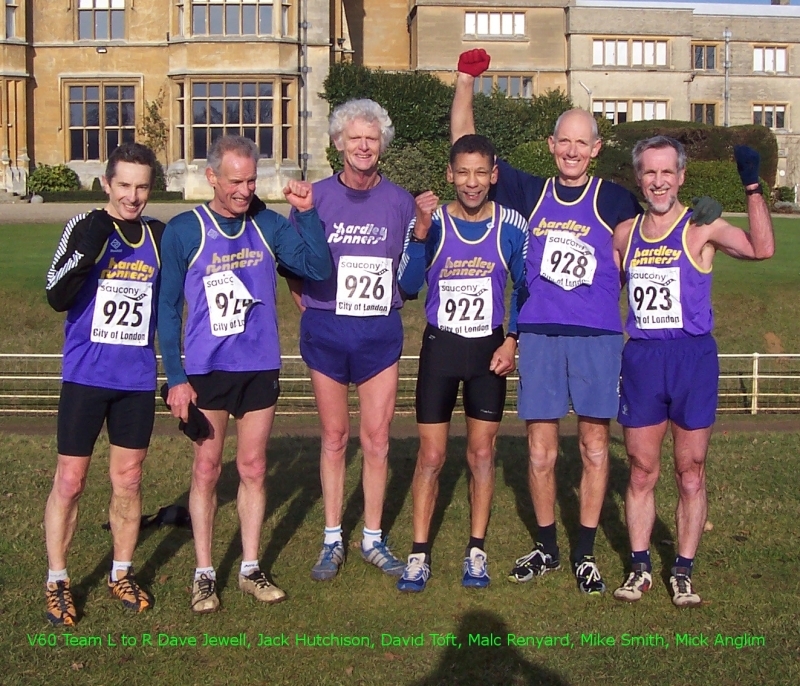 Hardley's Malc Renyard won the S.E.A.A cross country Vet60 category and the Hardley team picked up the silver medal for 2nd team home, behind a very strong Oxford City team. Hardley took a 7 man squad on a 300 mile round trip to Biggleswade, in Bedfordshire for this year's event. The scenic parkland at Old Warden Park, which is home to a college and a disused airfield, also had the inter counties juniors races making for a hectic schdule. The vet60 race was merged with the M50s and M55s but lack of age group stickers meant runners were unsure of their competition. The 3 lap undulating grassland 10k was suitably testing despite the lack of the traditional mud. Congratulations to Paul Ashley who came 4th. He writes, "A well organised race which was tough and testing at times on a scenic off road hilly trial course around the New Forest starting and finishing at Sandy Balls Holiday Park near Fordingbridge. 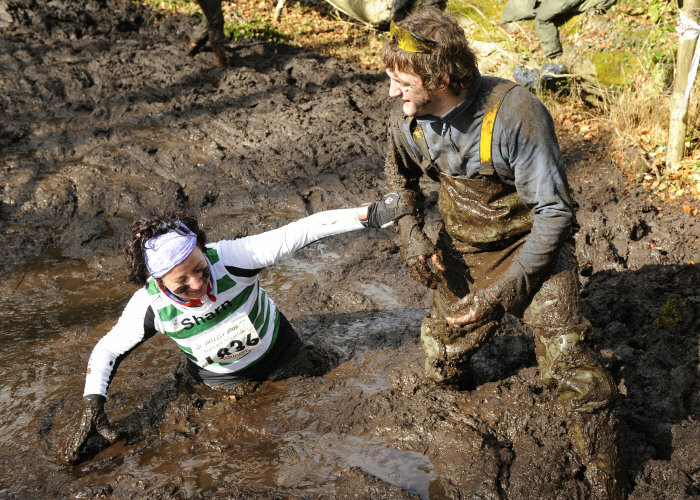 I'd recommend it to others who enjoy a good tough off road race." See the RaceNewForest site for the full results. An excellent event organised by the Amesbury Walkers. Well over a dozen Hardley members did distances of 20, 30 or 40K with great views of Stonehenge.This is a walking event. Runners are made very welcome but times are not recorded (just as well for those who were wiped out by the SEAA Cross Country the day before). The course was unrelenting mud ranging in depth from two inches to ten inches and varying from sticky to slippy - two laps (8k) for Dan and the Ladies and 4 (15K) for the Gents. John reckoned it was the hardest conditions he has ever run in. But at least it wasn't raining. The pic to the left shows your webmaster's shoe next morning after they had been bashed off a bit and left outside in the torrential overnight rain. Before that there was just mud visible - no shoes. Well done who all who came and particular thanks to Mick for driving and rising to a series of very interesting parking challenges. You can see the full results on the SEAA site (top left) and Rikko2Photo took lots of pictures which you can see here. 15 Hardley Runners turned out for this year's Rough 'n Tumble. As usual it was a hard race, this time made challenging (but less muddy) by the cold weather. Hardley results are below. For the full results see the race website There is also a huge photo gallery which you can search using the race numbers in the right hand column to see Hardley Runners in action. It was a perishingly cold day but very dry and the sun broke through a little which was lovely. Thanks very much to everyone who turned out to help and to those who put in the huge amount of preparatory work needed to make the event such a success. The going was dry and rock hard which made the bits that are normally muddy a challenge to the ankles. Congratulations to Malc Renyard who was first V60 and to the vet men's A team who were second. Sadly we didn't have enough ladies to get into the team medals this year. Hardley results are below. You can see the full results on the Hampshire Athletics site (see Links tab). Boy was it ever cold! Well done the men for a good turnout and Claire for winning again. Jenny comments, " Good turnout for the men but the women need to get up in the morning and not snuggle back under the duvet". The permafrost meant that the going was good, if a little firm and all in all it was a good race. Hardley results are below. The full results are on the CC6 page (see links tab). And, with thanks to Annie, here's and album of pictures.